What could be cooler and more intimidating looking than Marvel's own webslinger Spider-Man turning his back to you before he gets ready to attack? 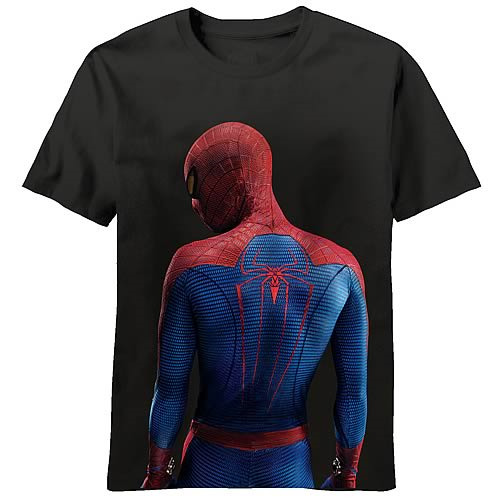 Whether you want your enemies to know that you mean business, or you simply want to wear an awesome black shirt with your favorite superhero on the front, this Amazing Spider-Man Side Glance Black T-Shirt is one terrific deal! Even the level of detail on Andrew Garfield' Spidey costume is insane! Why wear any other shirt when you can reach into your bedroom drawer and pull out the Amazing Spider-Man Side Glance Black T-Shirt? !